In honor of National Disability Employment Awareness month, October’s mission moment features individuals with I/DD who have recently received community employment through The Arc Jacksonville’s Employment Services team. The individuals we serve have all chosen The Arc Jacksonville to secure employment in the community. Ryan began working at Wowever Thrift and More at the beginning of August and currently works 20 hours a week. He enjoys working each day and having the opportunity to earn his own money and independence. His goal is to live independently in his own apartment. 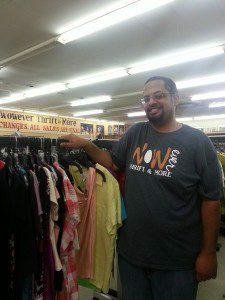 He’s responsible for hanging clothes, sorting through donations and keeping the sales floor neat. Ryan readily accepts new tasks when he is asked to perform something outside of his regular duties. 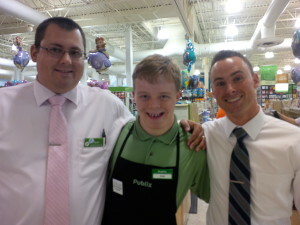 Andy is a proud, new employee of Publix Super Markets at Reedy Branch Commons. Andy serves as a valuable member of the Publix family as a Front End Service Clerk, where he is responsible for greeting patrons, bagging groceries, collecting carts, and providing exceptional customer service that encourages return customers. Andy is pictured with two of his supervisors, Josh and Ryan, who have succeeded in orchestrating an environment that embraces diversity and promotes both personal and professional development. Jerry currently works as a greeter at Brumos Motors, Orange Park. 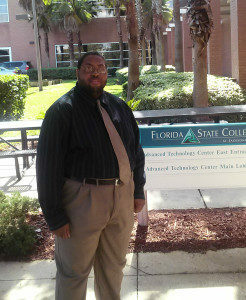 According to fellow co-workers, Jerry is the perfect fit for the job; “He’s just who we need to greet our customers.” He attends FSCJ, pursuing a degree in business. Jerry is quite computer-proficient, especially in Word and Excel, and he enjoys online social networking. 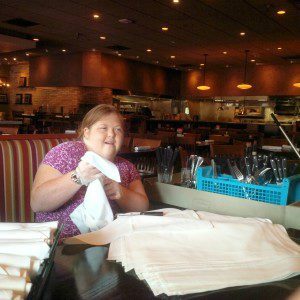 Lauren has worked as a Silverware Preparer at Carrabba’s Italian Grill, for three and a half years. She has recently obtained an increase in hours and now works five days per week. Lauren’s commitment to self-improvement, partnered with her desire to challenge herself, has been her key to success and has contributed to her ability to maintain meaningful employment. Lauren is pictured in-action, rolling silverware with a smile! Congratulations to everyone on their employment! We also want to thank our Employment Services team for all their hard work in finding the above individuals community employment. Keep up the good work! To find out more about The Arc Jacksonville’s Employment Services Department, contact Susan Hamilton, Vice President, Employment at shamilton@arcjacksonville.org.